Tuesday evening was probably the best weather we'll have this week: neither too cold nor too hot. We took advantage of the pleasant spring-like conditions to get some work done outside on the house. While we were doing so, we had a flyover. Military bases in our area include NAS Fallon to the east and an Air National Guard station at Reno. 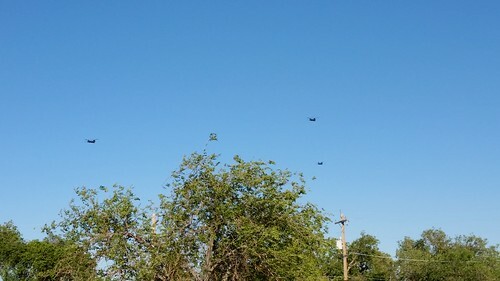 We know nothing more about why these three big helicopters were flying over Fernley. The only thing that kept us from getting more done was impending sundown, and of course the fact that I have to be up before 5 AM for Day Jobbe.